Las Vistas, Cabo Roig, Costa Blanca. 5-10 mins from beaches and golf by car. 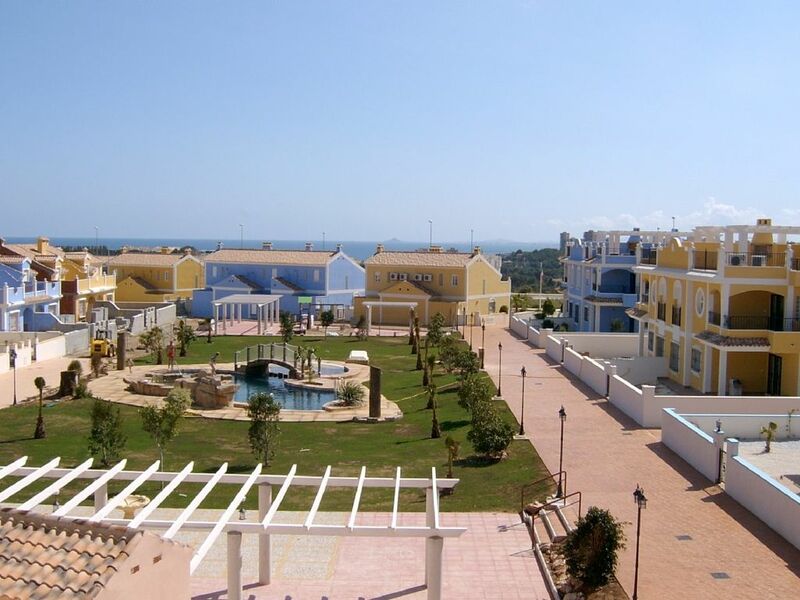 'Las Vistas' (Beautiful views) is situated in the beautiful area of Campoamor, on the Costa Blanca. It is ideally located for the Golf and the beautiful beaches of Campoamor, La Zenia etc, which are all 5-10 min's drive away. 20 mins walk to the nearest beach. A good selection of small bars (Irish, etc), and several restaurants less than 5 min's easy walking distance. The key holder will do airport runs, and trips to the beach and the main Cabo Roig strip, or further afield. She does the cleaning and laundry for 50 euros payable to her on site. There is a vast Saturday market at nearby Playa Flamenca. The property is in a gated complex with green areas and small play area (ideal for younger children) and a small pool. It is a first floor apartment with a private sun terrace with BBQ above, there are amazing views from the terrace across to the sea. It has 2 bedrooms and 1 bathroom, ideal for 4. (king size bed, and 2 singles), sofa settee in lounge. children beach things. Buckets and spades etc. Great. So pleased you enjoyed your stay. Just back from a relaxing 2 weeks. This is a lovely apartment in a quite area set in attractive grounds. There are a few good restaurants and bars within easy walking, likewise Aldi for shopping. It was just what we were looking for. I would say though, if you want to go to the beach it would be a hike and too far really, plus I wouldn't walk on the road to the strip..bit dodgy and far. We used taxis for Le Zenia as it wasn't a comfortable walk either. They were cheap enough and friendly drivers. We used the place above/next to the Irish bar to hire a car for a few days and found them pretty good. Did our beach trips with that. I'd certainly be looking to book in the future again. By the way...the owner is quick at responding and helpful..thanks Hazel. The apartment suited our needs. Wonderful roof terrace. The communal gardens and pool were well maintained. We had a great stay and would go back again. So pleased you enjoyed your stay. very secure property, easy to access by car off the main N332. Apartment has everything that is needed for a self catering holiday, although there are plenty of restaurants around, a few within a short walk of the apartment. Place was fine for a family of 5. It had everything that we needed and was central to Torrevieja, including the shops and beaches. Big Aldis within walking distance as well as a few bars and restaurants. You could stay at the place without a car, but having a car makes getting around a lot easier.